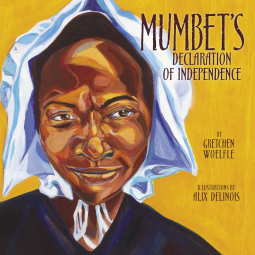 Today’s book review is for Mumbet’s Declaration of Independence, written by Gretchen Woelfle, illustrated by Alix Delinois, published by Lerner Publishing. It is scheduled for release on February 1, 2014. I received a free electronic copy of this book from the publisher, through NetGalley, in exchange for an honest review. While the American colonists were fighting for their independence from British rule, one woman was fighting for her freedom from slavery. Mumbet was a slave in the household of a wealthy Massachusetts man who was involved in the Revolutionary War. She hears him speak of all men being created equal and wonders if that includes her. When Massachusetts drafts its new constitution with those words, she decides to put the new law to the test. This beautiful picture book biography tells the story of the strong, proud woman whose court case set the precedent to abolish slavery in the state of Massachusetts. Delinois’s illustrations set the tone for the story. The bold, saturated colors create a feeling of intensity. The angular and somber faces tell the audience that this is an important story. Each character’s body language reveals aspects of their personality. In the case of Mumbet, nearly always standing tall and looking out to the horizon, we see a woman of confidence, strength, and vision. I liked that the art wasn’t just visually pleasing, but added depth and nuance to the story. The story itself is beautifully written. Woelfle was very skilled at paring down the narrative to be accessible to young readers, while keeping hold of the emotion of the story. I liked the way that she was able to make history come alive. While there are no records of precisely what Mumbet thought, writing the story from her perspective gave it a strong impact. Soon after I read it, I found myself sharing the story with my husband, because I’d found it so compelling. For those who would like to expand their history lesson, there are additional resources at the end of the book. The first is the author’s note which explains how this story was preserved for posterity, what we don’t know about the story, and how Mumbet is now part of historical tours. The second resource is a selected bibliography which provides suggestions for books that might be of interest to readers who enjoyed this story and want to learn more on the topic. This is a great book for Black History Month, Women’s History Month, a unit on the Revolutionary War, or discussion on the history of slavery in the United States. I’m giving the book 5 stars for being engaging and educational. It’s an excellent resource for teaching kids about history, and it’s a beautiful book to boot. It would be an excellent addition to any library, classroom, or home. 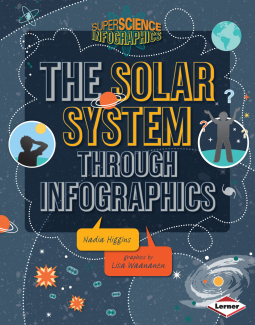 Today’s book review is for The Solar System Through Infographics, written by Nadia Higgins, illustrated by Lisa Waananen, published by Lerner Publishing Group. It is scheduled to be released on friday, November 1, 2013. I received an electronic copy of this book through NetGalley in exchange for an honest review. The first thing that I want to say about this book is that the title is a bit misleading. It would be more appropriately titled “Astronomy Through Infographics”, since it covers a lot of astronomical phenomena that are not found within our solar system. That said, it’s an excellent resource for anyone who is interested in learning more about astronomy. Higgins presents the sometimes overwhelming subject of astronomy in language that is accessible and easy to understand. She uses a congenial, relaxed tone to engage her readers and make science cool, rather than intimidating. The information presented was in accordance with what I learned in my astrophysics class at university, so I’d also say that she seems to have done well at presenting accurate information to her audience, as well. The one area where I think she could have done a better job was in distinguishing between weight and mass in the text–particularly because there is a table of weights on different planets in pounds and kilograms–where the SI unit should be Newtons. That said, it’s not a major issue. It’s Waananen’s graphics that really make the book, though. Her vector art style and bold color choices are eye-catching. And her infographics illustrate important concepts and ideas through timelines, flow charts, tables, graphs, and more. Besides helping kids to understand astronomy better, these graphics also introduce them to various tools that they can use to communicate ideas to others. In this way, the book pulls double duty on the educational value front. What I love most is the overall design. Before I had even gotten past the front matter I was thinking “this is a cool book!” It’s hip and on-trend. Rather than presenting information linearly, the book is set up so that you can jump around. Information appears in small chunks that can be easily digested before young minds get distracted. By using multiple typefaces, readers can distinguish different types of information on the page, as well. At the end, the book includes a glossary, index, and suggestions for further information (books and websites)–making it not just pretty, but also functional. Whether you have a child who is fascinated by astronomy or one who is science-phobic, this book is a great choice to nurture an interest in the subject. I think it’s a 5 out of 5 star book–it’s educational, it’s visually appealing, it’s functional, and it engages a variety of learning styles. It would make a great tool in the classroom and an excellent resource for a library.